The authorities of UNIZK wishes to inform the 2015/2016 Graduands of Nnamdi Azikiwe University, Awka, Parents/Guardians, Alumni of the University and the Public that activities marking the 11th Convocation Ceremonies of the University for the award of First and Higher Degrees, Diplomas and Certificates, Presentation of Prizes and Award of Honorary Degree will take place from Monday, 13th to Friday, 17th March, 2017. II. Academic outfits for all first degree Graduands will be collected at the Faculties. V. Collection of Convocation materials commences on Monday, 13th March, 2017. VI. 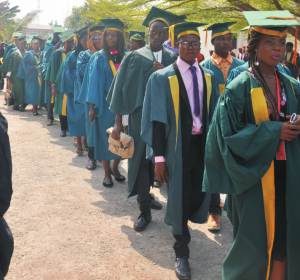 All hired academic outfits/gowns should be returned by the Graduands to their respective collection points not later than Wednesday, March 23, 2016. Gowns returned after that date will attract penalty. VII. All Graduands are to assemble at the School of Postgraduate Studies (Opposite the Convocation Arena) by 9.00 a.m. for the commencement of Procession each day. • Take the RRR number to any bank of your choice nation -wide and make payments.